A former Rwandan defence minister has fled to Uganda, along with two army officers, the government says. A government spokesman told the BBC that Brigadier General Emmanuel Habyarimana and his companions had been picked up by two Ugandan security operatives who were waiting for them at the border on Sunday. This defection is the latest sign of worsening tensions between former allies Uganda and Rwanda, who have been engaged in a war of words over fighting in north-eastern Democratic Republic of Congo. They have traded accusations of training rebel groups supported by the other side, that are based in DR Congo. On Monday, Rwandan-backed RCD rebels denied reports that thousands of Rwandan troops had crossed into DR Congo in breach of a peace deal signed last year. General Habyarimana left as a parliamentary report was published, accusing him of being involved in "subversive" activities. "The report must have been leaked to them and they decided to flee on the day the report was published," Joseph Bideri said. He was defence minister from 2000 until November last year, when Rwandan spokesman Joseph Bideri said he was sacked for his "extreme pro-Hutu" views. 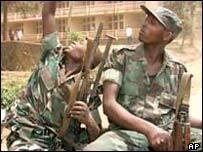 He was part of the former Rwandan army, some of whom were involved in the 1994 genocide against ethnic Tutsis. One of those who went with General Habyarimana was the army's representative in parliament, Lieutenant Colonel Balthazar Ndengeyinka. "Reports indicate that Brigadier General Habyarimana was working very closely with Ugandan security operatives, in particular with Uganda's minister of defence, in activities which were designed to destabilise this country," Mr Bideri said. Despite this apparent breach of security, Mr Bideri said he was not worried that Rwanda's security might be threatened. Following the recent escalation of tension around the north-eastern Congolese town of Bunia, the United Kingdom, a major donor to both countries, urged them not to resume hostilities.